History has never been my favorite subject (I'm far more interested in the future than in the past), but I've always felt that, aside from memorizing specific dates, history was a fairly easy subject to grasp. When one examines the "big" events in history, one can see how the world was effected by these occurrences and this makes it easier to grasp the idea. However, history, like so many things in life, can have side stories, and, in my opinion, this is where things get far more interesting. We all know the major players and key chapters in history, but what was happening to others during these periods? The Keeping Room examines this idea and brings us a new portrait of courage from the past. 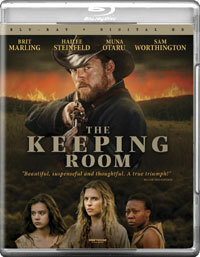 The Keeping Room takes place in the American south in the year 1865. Augusta (Brit Marling) lives on a small farm with her sister, Louise (Hailee Steinfeld), and Mad (Muna Otaru), a black woman. They tend to the crops and animals and, when not bickering, try to keep one another entertained. When Louise is injured, Augusta rides into "town" (it's just one building) for medicine, and finds that the other locals are being terrorized by Moses (Sam Worthington) and Henry (Kyle Soller), two Union soldiers who are part of a scouting party for Sherman's March through the south. The two drunken men are drawn to Augusta and after she escapes their grasps, they follow her back to the farm house. Now, the two sisters and Mad must protect their property and their dignity at all costs. The Keeping Room is a unique film in the sense that it proposes several interesting ideas to the viewer. First of all, what became of the females who were left behind during the Civil War? As thousands (millions?) of fathers and sons and brothers went off to fight, on both sides, mothers and daughters and sisters stayed at home and were forced to take over many of the tasks which had most likely been seen as exclusively for men. From taking care of farms to hunting to protecting the homestead, this turbulent time changed the face of how women took on life. We see this in the film, as the women are in charge of keeping everything up and running. (We are never told what happened to the mother.) Secondly, we have the Mad character. Based on how Louise treats her, it's pretty clear that she was once a slave in the household. But, slaves are now free. So, we get an awkward mixture of respect and camaraderie towards Mad from Augusta and a wealth of attitude towards her from Louise. How did slaves make this sudden transition. The film shows that it’s not easy to leave certain situations, especially if one has grown accustomed to it. The movie also examines the fact that soldiers at this time most likely had some form of PTSD. Moses and Henry had spent years fighting and killing and now their job is to simply be lookouts. This change has clearly been difficult for them, as they turn off the switch which gives them the urge to kill. In The Birdcage, Robin Williams’ character instructs a dancer to perform an eclectic celebration of dance, but to keep it all inside. I got the same kind of vibe from The Keeping Room. As noted above, the movie contains all sort of ideas, but it plays everything way too close to the vest. Following an incredible opening sequence, which shows that Director Daniel Barber has a very good visual sense, the movie settles down into a very quiet, staid piece which offers very little in the way of excitement. I don’t know if this is due to the script by Julia Hart or Barber’s approach towards the material. Once we meet all of the characters, we know that the men are going to come to the farm. But, we are forced to sit through many art-film scenes which show the women going about their days. It’s very challenging to watch a film where we know something should happen soon, and we feel that we are simply waiting. The other main issue with The Keeping Room is that once we strip away the historical and gender themes, what we are left with is an old-fashioned siege film. The men come to the house, the women barricade themselves in, and we wait to see what will happen next, just as we’ve seen in countless other films. This may be where Barber wasn’t a good candidate to helm this film. Early on, we clearly see his art-film aspirations, but when the third act should call for tension, he does not deliver. The finale is violent, but not gory, and it doesn’t pull any punches, but it also comes across as very unemotional, especially when a character who we don’t know dies. At the outset, The Keeping Room looks as if it’s going to offer something different, giving its setting and its focus on females, but, in the end, it’s just a western set in the south, and all of the great ideas in the world can’t overcome bad pacing. The Keeping Room never resolves the question of doing chores in a nice dress on Blu-ray Disc courtesy of Cinedigm. The film has been letterboxed at 1.85:1 and the Disc contains an AVC 1080p HD transfer which runs at an average of 30 Mbps. The image is very sharp and clear, showing no overt grain and no defects from the source materials. The overall palette of the film skews towards drab tones, but the colors look good and the image is never overly dark or bright. The level of detail is excellent and the depth works well, especially in the opening scene. The Disc carries a DTS-HD Master Audio 5.1 track which runs at 48 kHz and an average of 4.0 Mbps. For the most part, this is a quite film, but the sound impresses during the third act, as gunfire offers some bass response, while the stereo and rear speakers are put to use illustrating sounds coming from throughout the house. The Keeping Room Blu-ray Disc contains only a smattering of extra features. We begin with an AUDIO COMMENTARY from Brit Marling and Writer Julia Hart. "The Making of The Keeping Room" (11 minutes) contains interviews with the principal cast members who discuss the story, the themes, their characters, the production and their experiences working with the director. We also get some on-set footage here. Surprisingly, we don't hear from any of the creative team. The final extra is a THEATRICAL TRAILER for the film.